We’re delighted to be working with Sweet Baboo once again! 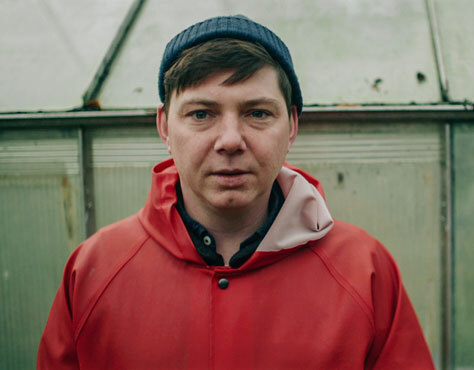 Moshi Moshi are excited to announce the new album from Sweet Baboo, aka North Wales’ musician Stephen Black, on 2 June. “When you feel the need for space, run away from place to place,” he sings, offering an irresistible invitation: “Here’s two train tickets, let’s go!” After the Harry Nilsson-esque love songs of 2015’s The Boombox Ballads, Black embarks on a new mission on Wild Imagination: to find the perfect pick-me-up antidote to the winter of our discontent. The result is a bright, wry, melodically buoyant and sweetly melancholy tonic from the North Wales (born in Trefriw, near Snowdonia; now Cardiff-based) singer: a tribute to the joys of travel and the warming return home alike. Previously, Black’s co-travelling collaborators have included Carmarthenshire’s Cate Le Bon. But his sweet sentiments and winning melodies have been constant companions for all open-hearted listeners since 2003. And they prove so once more on Wild Imagination, with impeccable timing. The ten positive missives assembled for Wild Imagination are fully alert to the transporting and restorative possibilities of pop music. The lovingly nurtured, brass-warmed introduction of The Gardener is Black’s attempt to mimic the insta-pep opening of The Beach Boys’ California Girls; co-conspirator Paul Jones provided the arrangement, Black and multi-instrumentalist Rob Jones played the music. Another influence was Moog wizard Mort Garson’s 1976 LP Plantasia, an album made for tending plants to: tending one’s garden being very much on Black’s mind here. Black’s church of pop uplift is a broad one. While Boombox looked to everyone from Nilsson to Scott Walker for inspiration, Wild Imagination frames Black as a gently inquisitive psych-pop explorer of pop classicism’s outer reaches, forever seeking out fresh melodies to brighten the perspective on a darkening world. A user-friendly spirit is sustained with a second-half segue in the shape of The Night Gardener, another instrumental. Hold On, meanwhile, is a lovingly intimate pick-you-up delivered with an abundance of charm. “Hold on to that smile, that smile makes coming home worthwhile,” sings Black, summing up the joys of returning home after time on tour. A spirit of romance continues to fuel Black towards the album’s close. On Humberside, he counts his blessings and suggests a trip to Yorkshire to ease the soul. Finally, he ventures out to America’s West Coast and back for Californ-I-A, a gently lapping lullaby for the weary traveler or child and a lovingly Nilsson-esque send-off for an album rich in warmth and wonder. Either way, by train or ship, bag a ticket and hop on board. If 2017 is getting you down, a little Wild Imagination might just lift you out of it for a while. Main support comes from Douga. Douga combine a love for melody and classic songwriting with influences from the worlds of experimental and improvised music. They’ve previously supported artists such as Omni, H Hawkline, Meg Baird, Quilt and Lorelle Meets The Obsolete. Their music has been played on BBC 6 Music and Radio 3. They’ve steadily been building a reputation for their live shows which showcase their knack for interesting textures and expansive arrangements. Expect songs interspersed with soundscapes, drones, feedback, and a stage littered with pedalboards and bashed up Casios. The band recently completed a second album, due for release in the autumn. Opening the show are Other Animals. Other Animals are the Australian group that left Melbourne, the country’s greatest city for live music, to relocate to European pastures. Fast forward to late 2016 and the band have finished their debut album: a gargantuan rock opera that underscores the bands eclectic experience in songwriting. The flute, horns, strings and percussion are pure icing. Delicious, indulgent and probably bad for your teeth.